You inspire me everyday, you shell collectors, star gazers, singers, stitchery witches, collectors, dirty diarists, dresser-uppers, and you wise, wise women with stories to tell and decisions to make. I stitch the books for you. Your stories connect us all: these narrative stitches bind us. 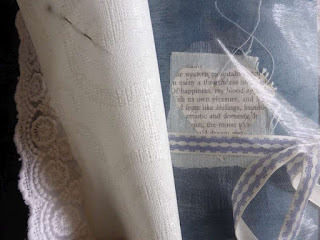 The woman who wanted a book into which she could stitch small pieces of fabric of her husband's clothing with his words and small objects from his life. The book made to slip close under her pillow for wakeful nights to touch and feel a memory to stay, after death. The woman who needed a book as a private place: her home, life, had become no longer private. Her child, drug-abusing and desperate for money, had stolen every private place and had taken every item of value, including grandmother's rings and mother's bracelets. A book here is an item of no value, but a place to write a message, knowing it would be seen. The man who had a stroke. His fingers, no longer sensitive or feeling. With a tactile book he could learn to tell the difference again, slowly, between rough and smooth, heavy and light, cold and warm. The live action role play enthusiast whose joy at discovering a book with a miniature skull stitched to the cover, whose role was skull-maker and bone-dealer, your infectious laughter and stories of skull battallions cured us all. The woman whose mother lived with dementia: the book was to be a common bond. 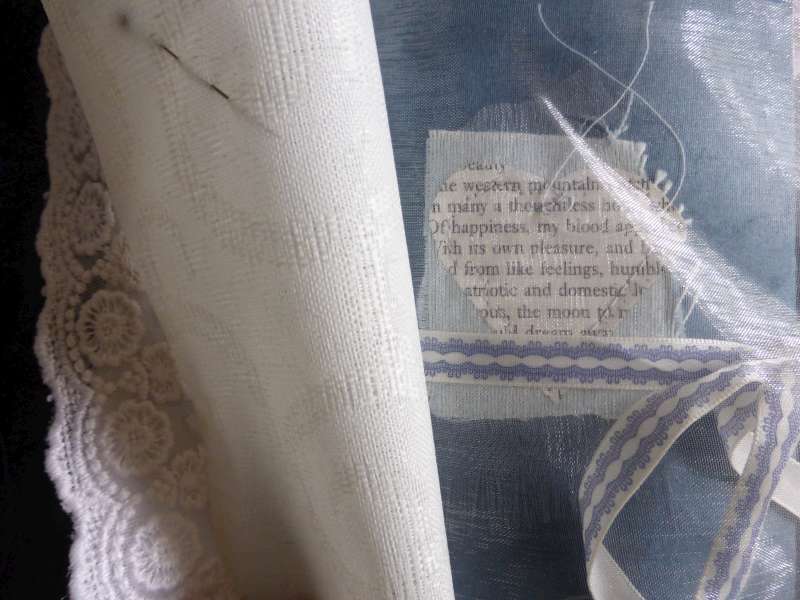 A place to connect as the last fragments were scraped together in a narrative of a life: a photograph stored, a lock of hair, a wedding ring stitched into felt, a sentence spoken, a ribbon made from the threads of a favourite dress. The woman who stayed at the stall for two hours, talking to everyone who came close, telling us how the books took a place in a life of travel, even though she could no longer stray far: the books had become a place for journeying from the life lived round a kitchen table, with tea, and biscuits, and memories. The man who was thinking deep and wide about his religious faith: what it meant to him and what new place it was becoming in his life. To mark this transition, a simple book with a wrapping bind, quiet and unobtrusive, a silent testimony to a soul's journey. The couple getting married: you bickered over which book you should keep together and send around the guests on your wedding day to write in messages of hope, the future. You made up with a kiss, and someone cried. The woman who had lost a child aged seven, who saved in her book the photographs of the family before and after this life-changing moment. Into the pockets, the fragile messages of faith that held the threads together. There are so many, many more of you: you bring joy and sorrow in equal measure, and I love to meet you. You are wonderful, inspiring people who touch grief, loss, trauma, joy, wonder, memory, passion and desire in your lives, everyday. You tell us what it is to be human. Come and talk and handle books. You can find me at Stall 13 on the Vintage and Handmade weekends in CMK, four times a year.